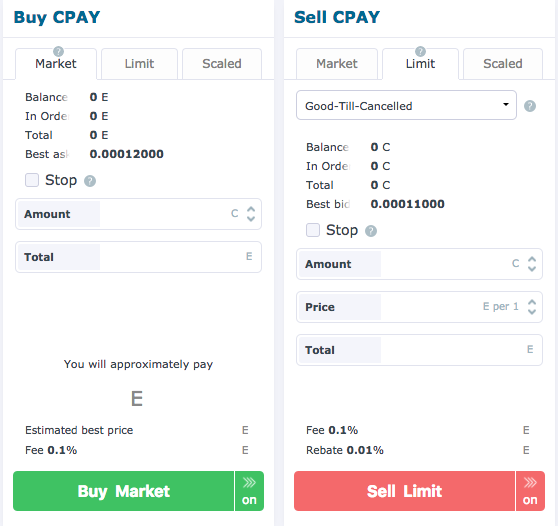 Do you want to buy or sell CPAY tokens on HitBTC? We will provide you with the step-by-step guide on how to start trading. HitBTC charges fees for deposits and withdrawals. Trading fees can be charged for placement and execution of certain orders. You can find more information in this article. Let’s imagine that you want to buy some CPAY tokens. Use the ETH address of your HitBTC account as a destination for Ethereum transaction. (!) Please be informed that for each asset in your HitBTC account there's a separate unique address. It’s not possible to send certain coin to the wrong address successfully. So, make sure that you chose ETH wallet for the ETH deposit! You can read about the recovery of mistakenly sent deposits here. Important: if you have generated an address before, make sure it has not changed. All old addresses are connected to your account, but they might be disabled eventually. So it is important to use the most recent address. When your funds reach HitBTC, you will see a pending transaction in the "Latest transactions" section at the bottom of the Account page. It will be processed shortly. If it doesn’t, this article might be helpful. Just hit a blue arrow between the accounts. Specify the necessary amount and click "Transfer". 3. After your coins have been transferred to the Trading account, go to the Trading Terminal and feel free to set up an order. You can choose among 3 types of orders. Please check these articles to find more information about them: Market orders, Limit orders, Scaled orders. 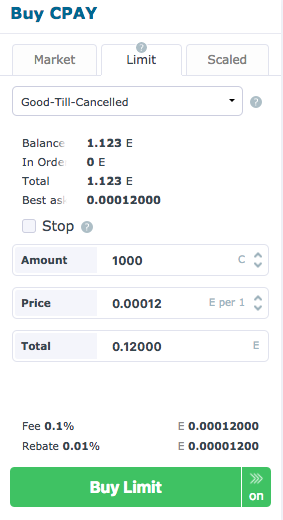 The market price is defined as the best available price at the moment when the order is placed. Since the price changes in the real-time, the Total and Fee are provided as estimates rather than exact values. Limit orders are used by traders who have decided on the price at which they are willing to trade. 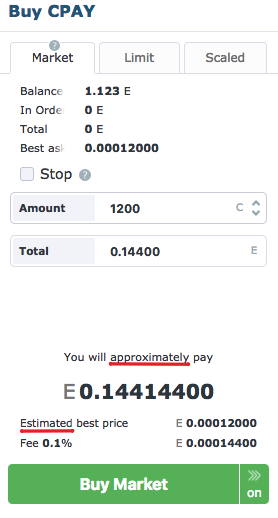 So, if you use a limit order, you choose the price yourself. 5. Congratulations! You’re a trader now! You can use your CPAY tokens for further trading or withdraw them to your ERC20 compatible ETH wallet. The detailed information regarding the withdrawal process can be found in this article. Please note this article is composed to provide our clients with the general information on how to use HitBTC services in order to buy or sell CPAY tokens. HitBTC is a separate company. If you have any further questions regarding HitBTC services, you can visit their Help Center or contact them directly via this form.